It may seem a little odd that the Lord gave Lehi a vision where He gave Lehi a book to read about the destruction of Jerusalem, since, after all, it’s a vision, right? Couldn’t the Lord have just shown the destruction to Lehi? But Lehi wasn’t the only one given a book in a vision. 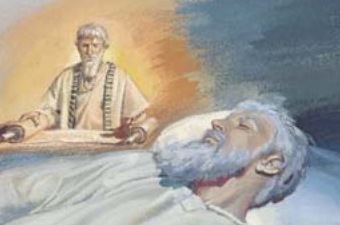 Ezekial also had a vision where he was handed a book. By this time, Lehi had learned to take such dreams very seriously. Plus, being able to clearly read words is an additional proof that this is a vision, and not just a dream. In a dream, reading anything is terribly difficult, if at all possible. Reading these words had a profound effect on Lehi. They filled him with the Spirit and caused his heart to both mourn for Jerusalem and rejoice in the goodness of the Lord. This entry was posted in Book of Mormon, Book of Mormon: Verse By Verse Commentary. Bookmark the permalink.